As I am sure you have noticed I love to find alternate uses for things I already have in my kitchen. Whether that is a tool or an ingredient, I love making the most of what is already there. 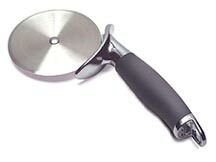 Today's "making the most" topic is pizza stones and cutters. Cookie cutter – Whatever shape you want. Cut bacon – Makes breakfast burritos much faster! Frozen convenience foods - Honestly, this is probably what we use our flat stones for the most, aside from pizza. Chicken nuggets, frozen french fries, jalapeno poppers, biscuits, frozen pizza, Hot Pockets, pizza bites… all of those frozen convenience foods will cook better if you put them on a stone in the oven. Healthy chicken nuggets - To make homemade chicken nuggets, combine corn flake crumbs with grated Parmesan cheese (the freshly grated stuff, not that white powder in the can). Cut a chicken breast into strips or bite-sized pieces. Dip the pieces into beaten egg, then into the corn flake/cheese mixture. Bake on a stone at 350 for about 20 minutes, or until the chicken is cooked through. Healthy french fries - Basically, you just cut the potato into fry shapes, season, and bake for 20 to 25 minutes at 350. Healthy snacks – To make potato chips, cut the potato into thin slices, season, and bake for about 20 minutes at 350. Alternately, cut pitas or tortillas into wedges and bake for 8 to 12 minutes at 350. Falafels – The nice thing about stoneware is that the stone absorbs excess moisture. That makes your falafels light and crisp and not at all soggy. Perfect! Pretzels – When we made these, we used a kit from Auntie Anne's, but you could just as easily use a recipe and make pretzels from scratch. Want a quicker way to make pretzels at home? Use prepared breadstick dough, form into pretzel shapes, and bake. Quesadillas – Take a tortilla, add a handful of cheese and whatever toppings you like (sliced black olives, mushrooms, and salsa if you're Joe and me), top with a second tortilla, and bake at 350 for about 8 minutes or until the cheese melts. Giant cookie - Cookie dough is naturally thick, so you don't have to worry about it running off of the stone. Use commercially prepared dough or a homemade recipe, spread it thick on the stone, and bake. You'll have to check it often; the large cookie will take a lot longer to bake than smaller cookies from the same recipe. When it's finished, you can decorate like a cake or top with fruit to make a dessert pizza. If you're using your stone for the first time, bake something fatty on it or spritz it with a bit of cooking spray. Don't go overboard on the cooking spray, though, because it can make the stone sticky. Once the stone has become seasoned, it will have a non-stick quality. Don't ever use soap on your stone. Clean it with very hot water, scrape the debris off, and put it away. It's as simple as that!